The second annual Disabled Access Day on 12th March aims to encourage disabled people, their friends and families to visit somewhere new, whether that's a coffee shop, cinema, museum or sports centre. 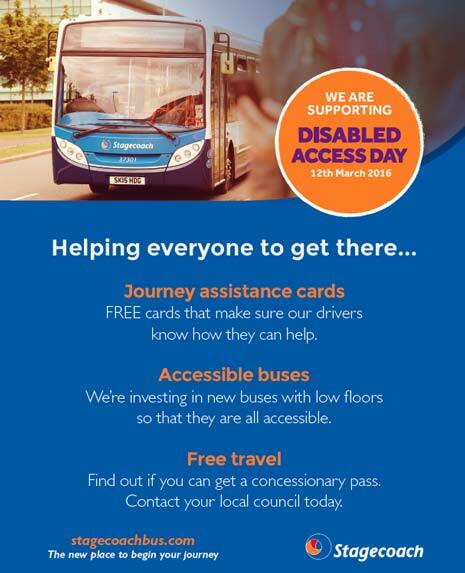 Stagecoach will be contacting local disability groups across South Yorkshire and North Derbyshire to highlight the facilities and options already available to make bus travel as easy as possible for all customers. These include low-floor, easily accessible vehicles and Journey Assistance Cards, which feature a range of messages informing drivers if customers need any extra help during their bus journey such as speaking slowly, scanning passes or counting change. 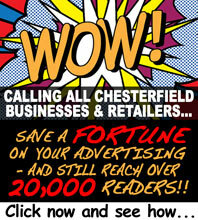 A Disabled Access Day poster campaign (above), will also appear on Stagecoach buses in Sheffield, Chesterfield, Rotherham, Doncaster, Barnsley and the Dearne Valley. Paul Lynch, managing director of Stagecoach Yorkshire, said: "We are proud to be supporting this important awareness day as part of our commitment to making bus travel as easy as possible for disabled people, their friends and families. "At Stagecoach, we are constantly investing in updating our vehicles to improve access and space for the disabled in wheelchairs, disabled buggies and certain approved mobility scooters. In fact, Stagecoach Yorkshire runs low-floor buses on all of its routes. "All new staff undergo training in disability awareness and social inclusion and we regularly host training days for drivers to experience the barriers that passengers with disabilities face when boarding the bus." Stagecoach has committed to a charter, produced with the Royal National Institute of Blind People (RNIB) that promises to improve the accessibility of local bus services as well as raise awareness among employees of the need to understand the practical issues faced by blind and partially sighted customers. Stagecoach is also a member of the Accessible Travel Alliance - a group made up of forward-thinking travel operators working to make a lasting difference to disabled people's experience of travel.